← New for Halloween 2016: M&M’s Target-Exclusive White BOO-terscotch!! 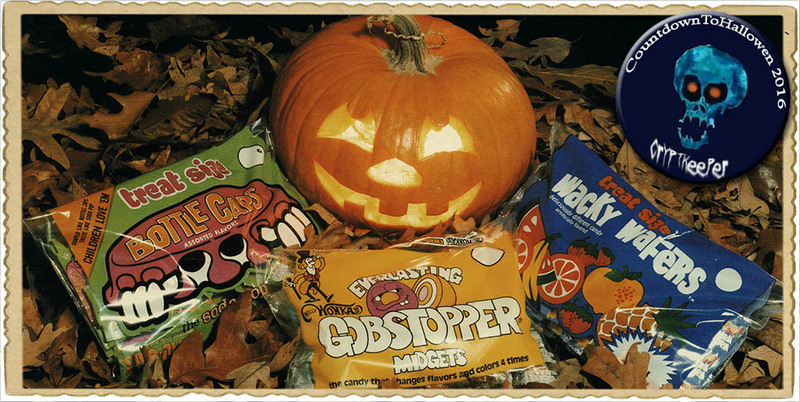 Today I’ll be sharing an amazing piece from the late 1970’s that details a trio of treat-size Halloween offerings from Breaker Confections – Breaker being one early part of the Wonka brand family. 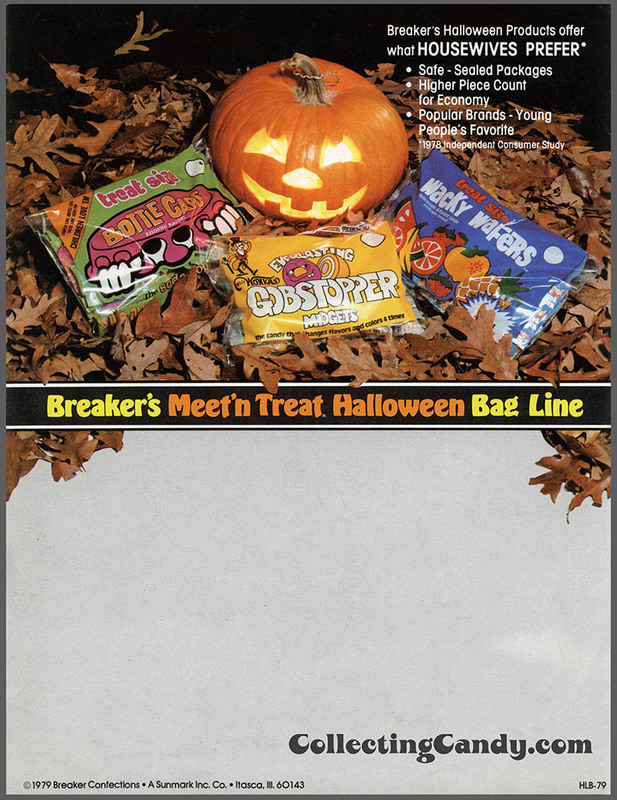 Make the jump to check out Breaker Confections 1978 Meet ‘n Treat Halloween sales brochure! 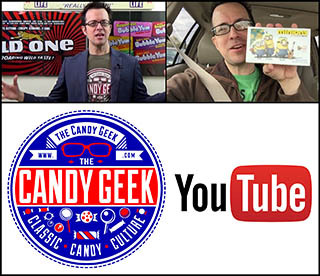 Tracking down vintage (and even not-so-vintage) sales materials for candy has always been an important part of my research into the history of confectionery brands, and that is certainly true for the Wonka line and its related products. Sometimes a sales sheet or brochure can reveal previously unknown line extensions or entirely forgotten products that might not otherwise be known. Today’s example isn’t quite so earth-shattering as that, but due to the product lines it covers, it still stands out as pretty awesome. The packaging graphics shown in these materials are striking, and unfortunately I’ve never come across any actual examples of the graphical outer plastic packs. 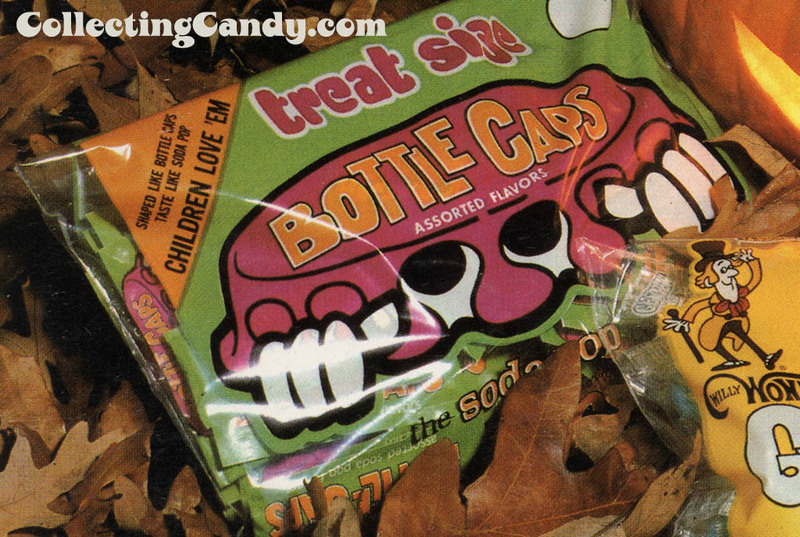 But while I have never tracked down those treasures, I have encountered examples of the small treat-size paper wrappers themselves and I have both a Bottle Caps as well as a Wacky Wafers treat size to show today. What I found especially interesting in regard to the smaller inner packs was the packaging design of the Bottle Caps treat size wrappers shown in the brochure. 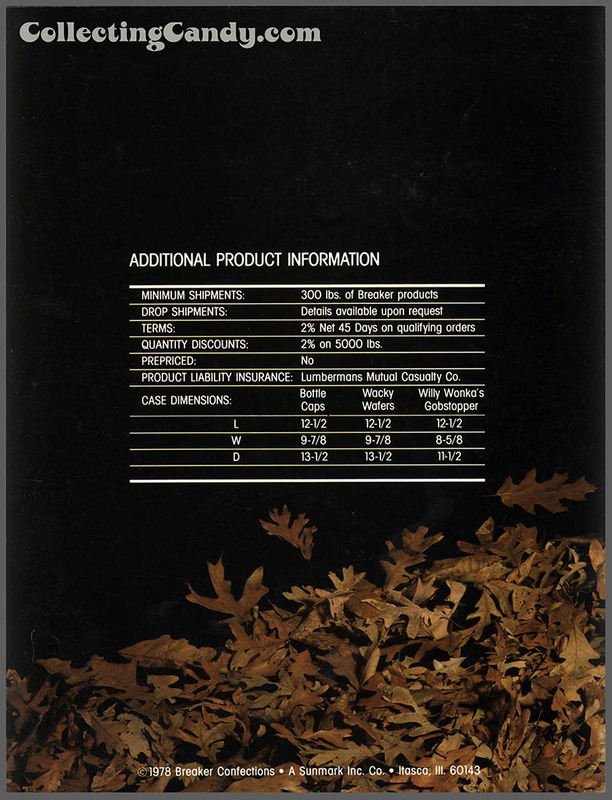 Of note, these sales materials are dated 1978 and 1979 respectively, and I’ve gathered evidence that the style of treat-size Bottle Caps wrapper included in them was getting retired right around the time these materials were being distributed. In the following image, I show a treat-size Bottle Caps wrapper as well as a treat-size Wacky Wafers pack that appears to be the same as those in the brochure. 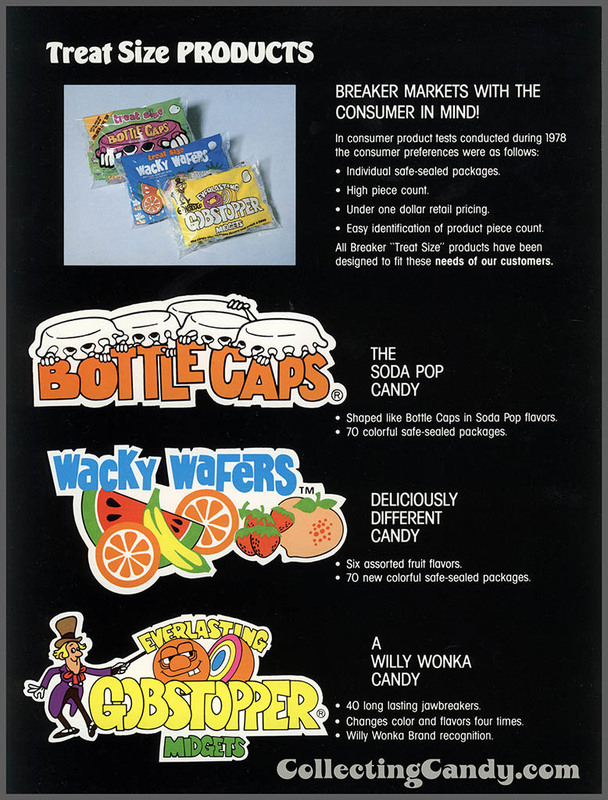 But along with that Wacky Wafers (which sports a 1978 copyright) is a different design version of the Bottle Caps treat-size wrapper, also copyrighted 1978. 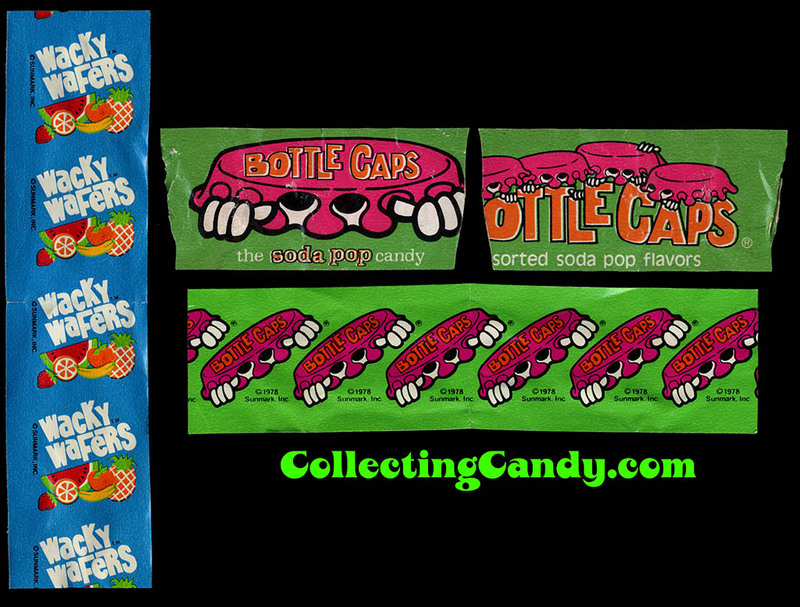 My belief is that the repeating image Bottle Caps treat-size design was one that came after the version that simply utilized a shrunk down version of the full size pack. Whatever the case may be, I think they’re all pretty awesome and it’s great to be able to finally share them and put some historical context to them. 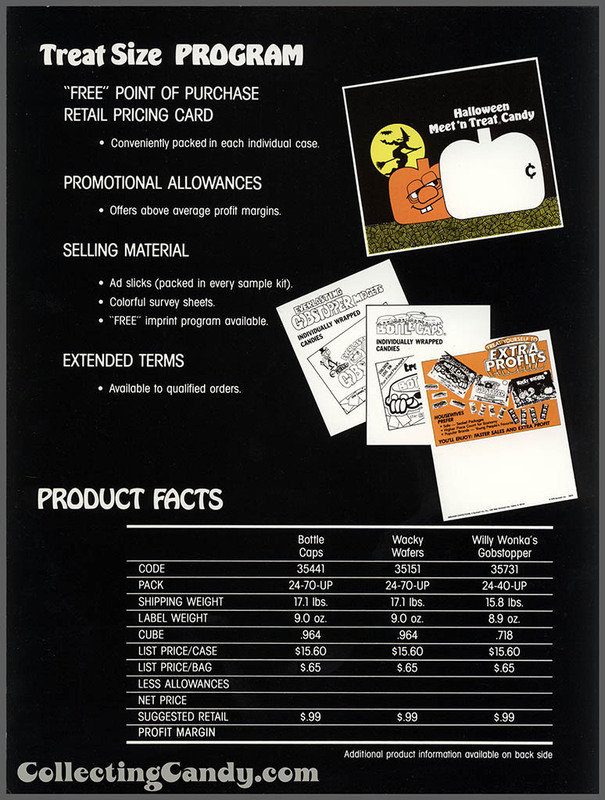 And that’s everything I’ve got on Breaker’s 1978 Halloween Bag Line brochure. See you next time! This entry was posted in 1970's, CountdownToHalloween, Halloween, Holiday, Nestle, Wonka and tagged 1970's, 70's, 70's candy, candy collecting, candy collection, candy collector, candy wrapper collection, candy wrapper collector, collectible, collecting candy, confectionery, confections, Halloween, Halloween candy, packaging, packaging design, sweets, vintage candy wrappers, vintage Halloween, Wonka, Wonka Halloween, wrapper. Bookmark the permalink. 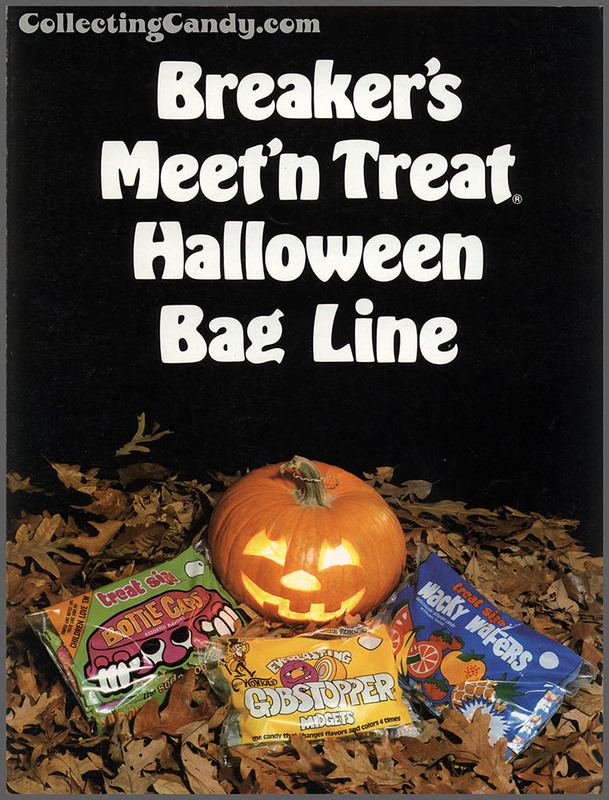 1 Response to Breaker Confections 1978 Meet ‘n Treat Halloween Line Brochure! After staring at that Wacky Wafers logo on page 2 of the 1st brochure for a few minutes I’m now wanting a t-shirt with that great graphic. On a side note, I’m surprised Breaker would refer to themselves as products “housewives” prefer… By 1979 you’d think they’d have moved on to “parents” or at least “moms”!